This darling heart-shaped Nantucket Basket is based on a similar Nantucket basket originally crafted by Mr. Nap Plank of Nantucket Island. The rims are single lashed and nailed with thin brass escutcheon pins. As a finishing touch, an ivory heart carving and ivory plug complete this Nantucket basket. As with all my Nantucket baskets, fine craftsmanship throughout. The Heart Nantucket Basket make an elegant candy dish and displays beautifully! Signed and dated on the base. The Ivory Heart Nantucket Basket measures 6.5" x 6.5" and 3.5" high. 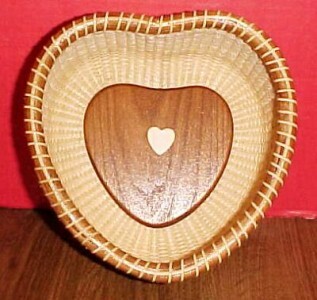 Although I am no longer accepting orders for the Nantucket Basket Heart, I may craft one or two of these per year. When its ready for sale, you can purchase it directly from my Simply Baskets website.